All 15 rooms are villa type of rooms. You can choose either one of these rooms and reserve. Christianity came to Amakusa in 1566. At the same time the ideology of Western culture came with Christianity. When two different cultures come together something unique comes out of the differences. 16th century Amakusa was like that. The theme of “Medieval Amakusa=A cradle of Christianity”. The place is higher up than Villa A and B. The silence around you will make your body and soul be immersed to the nature around you. From the ancient time Amakusa was connected to the world with the open sea around. 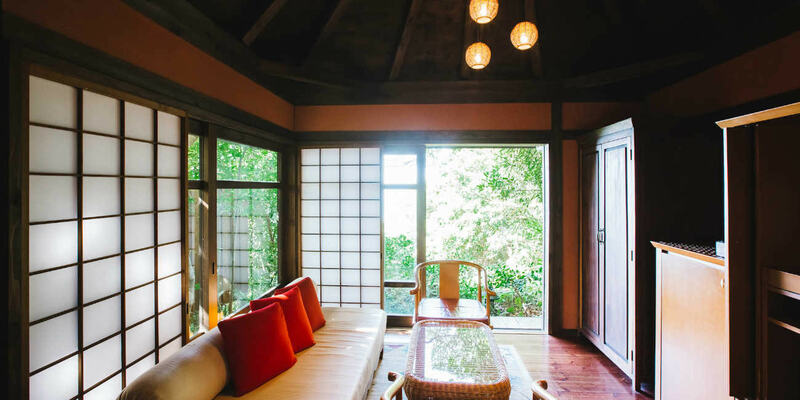 “Old Amakusa 's traditions create the new modern Amakusa” the theme of this villa. Please imagine the beautiful scenery; When the sun slowly englobes the sea the sky becomes magenta then in the morning the East China Sea becomes sky blue that is calling for you. Across the balcony you can see the magnificent sea that connects Amakusa and the world. 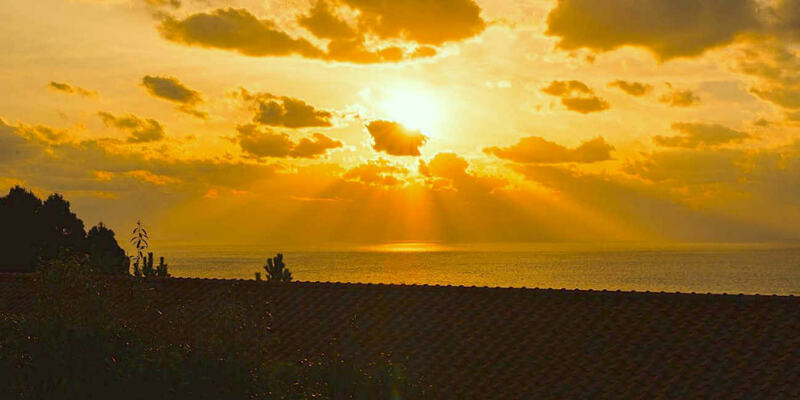 In order to find the connecting point of the sky and the sea, if we go across the waters we can see the new world. “The New Amakusa=the future of Amakusa” is shown in these villas. The people of Amakusa have lived with the sea throughout history. 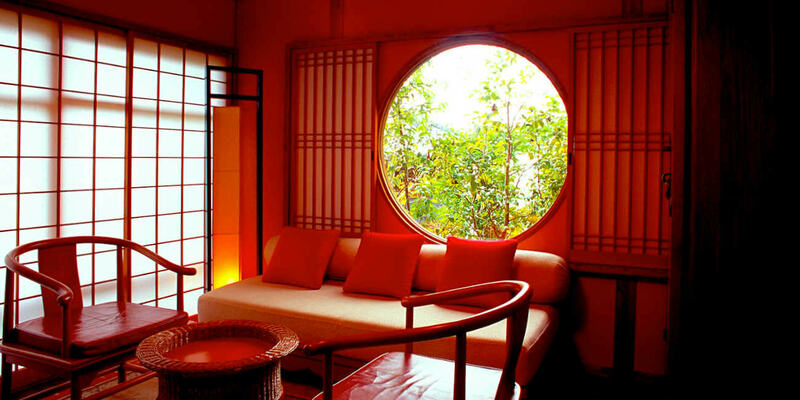 This villa`s theme is the traditional Amakusa. 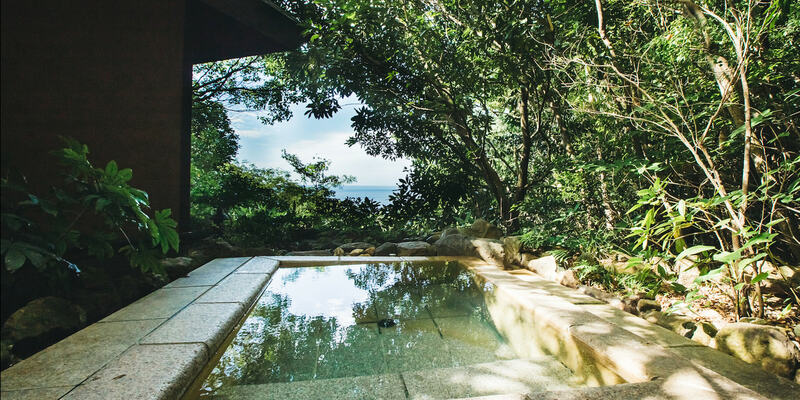 This villa makes you believe you are in the Amakusa fishermen’s town of simplicity. In the backyard you can hear the soothing sounds of the birds chirping and the bugs buzzing. The tree color changes every season to make the new season more colorful yet relaxes your mind and soul. Which is a sanctuary. *The price listed is for one night for one guest, including two meals & the service charge, not including Bath Tax(¥150)&Consumption Tax. *For a check-in on a Saturday or the day before a public holiday, fees are higher by ¥2,000 compared to the rest of the week. *During Golden Week, End of Year, and New Year Holidays, some special days depending on public holidays, fees increase by ¥10,000 (¥5,000 for a child).For further details, please call us. *Single use of a unit is available, but must be booked by phone or e-mail(Internet booking for single stay is not available). Free Wi-Fi is available in Gosoku-no-kutsu. Gosoku-no-Kutsu consists of two sections: Villas A/B opened in July 2002, and Villas C opened in October 2005. 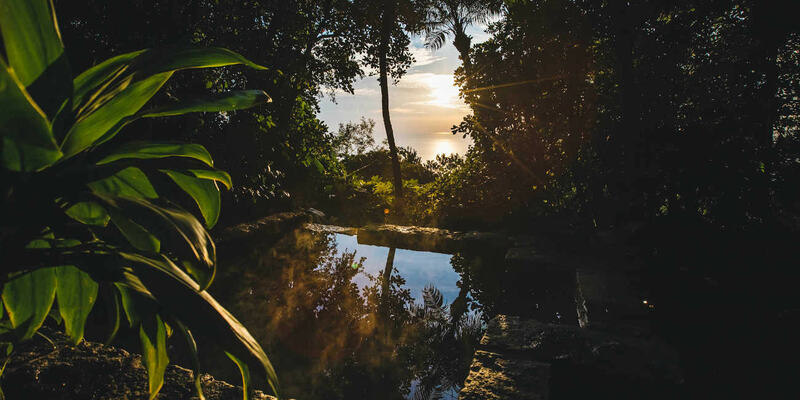 Villas C are located higher on the mountainside, completely separated from Villas A/B. Both the ambience and meals are completely different in each section. 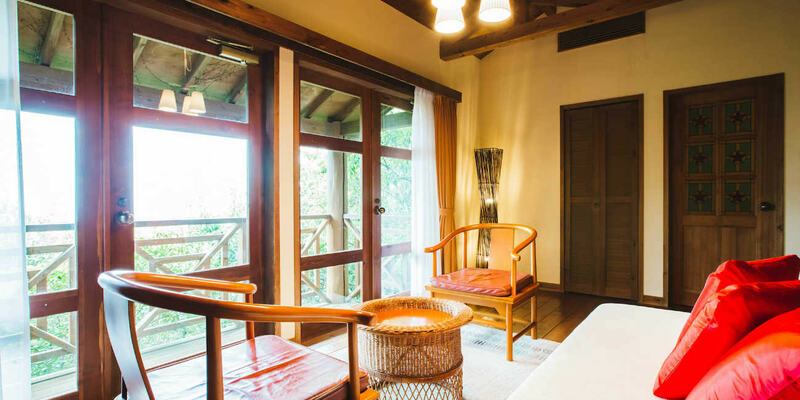 Room Charge:Villas A/B and Villas C prices vary according to the layout of each villa, and the meals served. The meals available for children are & ldquo;Amakusa Beef Steak”, “Local Fish” or “Sushi”. Please choose one according to your child’s preferences. For a long stay reservation, we may ask for prepayment for a part of the booking. 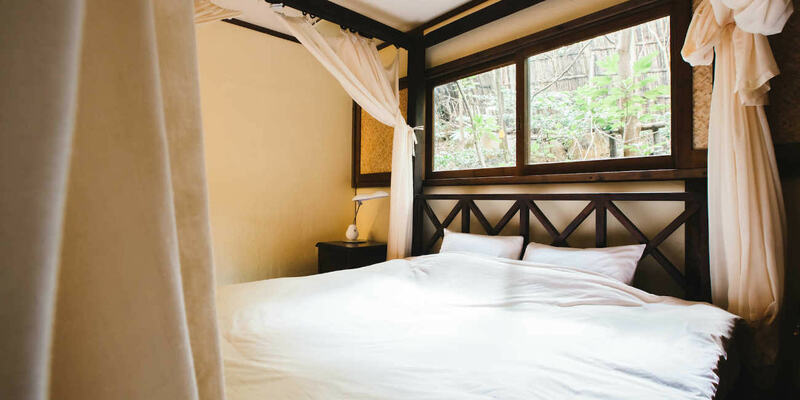 For a long term booking, there may be a case of cancellation due to other booking. We do not accept a tentative booking. In the case of repeated cancellation, we may reject the booking afterward. This includes using false names, or other family member's name. When we can't contact the client, the booking may be cancelled, please make sure to use the phone number we can surely get in touch with. ＊JAL card users will get a free coffee at the bar. If you are arriving by car, please follow the signs. Villa C is located on a slope above Villa A and B. For guests with disabilities or small children, it would be recommended not to stay in Villa C-1 as there are rocky steps leading up to the entrance making it inconvenient or dangerous. For guests with disabilities, the staff will show you to your room, so please feel free to let us know. We always tend to our guests with a barrier-free heart, so all our guests can feel at ease when coming. By phone: We take reservations from 8:30AM of the beginning of a month, 6 months in advance. cf, If you are wanting to stay on the 27th of January, you can make reservations from 8:30AM of 1st of July. By internet: We take reservations from 8:30AM of the beginning of a month, 6 months in advance. Cf, If you are wanting to stay on the 27th of January, you can make reservations from 8:30PM of 1st of July. 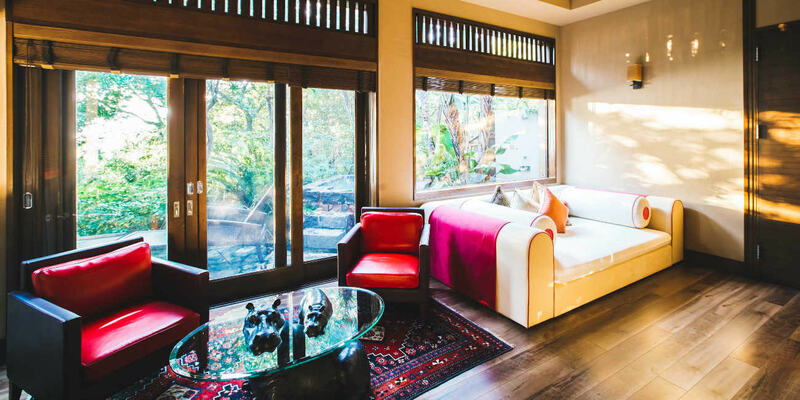 To make your stay a comfortable and memorable one, we will do our best to suit your needs. Please let us know if there are any requests while you are staying here, allergies, room preferences, pick up, etc. For birthdays, anniversaries and other special occasions, we have numerous services (additional fees). We can prepare a sashimi platter with snapper, spiny lobster and other fresh seafood, birthday cakes (3,500 yen), flowers (3,500 yen〜). We also have a selection of champagnes (Moet 1/2 bottle-4,500 yen, full bottle-8,700yen). Please let us know when you make reservations. If you are staying here for a special occasion with friends or family, the bartender will make you an original cocktail (we will make a non-alcoholic drink if you cannot take alcohol). Please let us know when you make reservations. Since our opening in 2002, we have had many guests from all over Japan. Thanks to the popularity, we have many days when we were booked out. Thus, we may not be able to book your preferred dates. We do have a waiting list however, so please let us know. For those on the waiting list, once there is a cancelation and a room becomes available, we call those in the order of request. When we call and cannot get through, we will leave a message on your answering machine. We apologize for the inconvenience but as we have a large number of guests on the waiting list, we have set a time limit. In addition, if we cannot get through to either a guest or an answering machine, your waiting list request will not be valid. We accept a waiting list request by phone or e-mail.